6,000 grizzly bears, 284 species of birds . . . and 36,000 humans." And about 75% of those few humans live in the scenic city of Whitehorse, capital of the Yukon (still abbreviated YT but not as commonly called "Yukon Territories" any more). That means most of this large province is uninhabited by people. 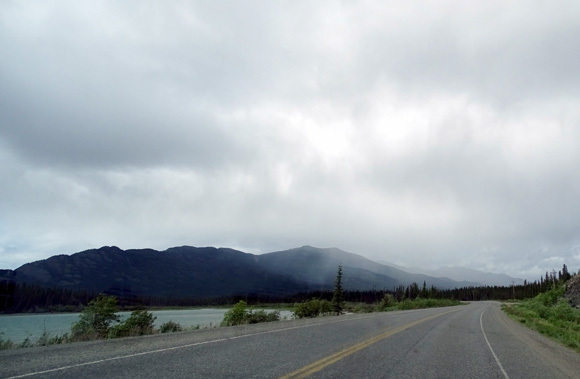 The segment of the Alaska Highway that winds through the Yukon is my favorite part of the long drive to Alaska. It's rugged, wild, remote and fabulously scenic, especially on sunny days. Long, winding, lonely road -- love it!! 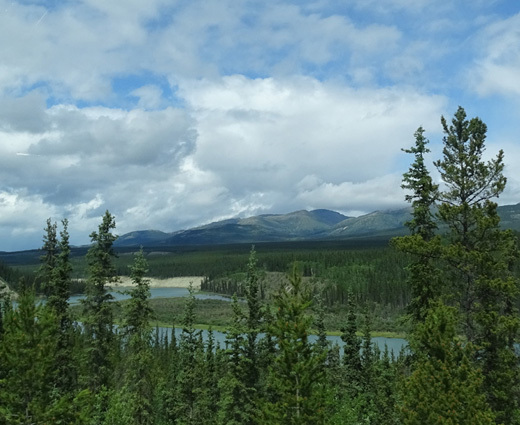 We got to enjoy more of the Yukon today on our drive from Watson Lake to Whitehorse. 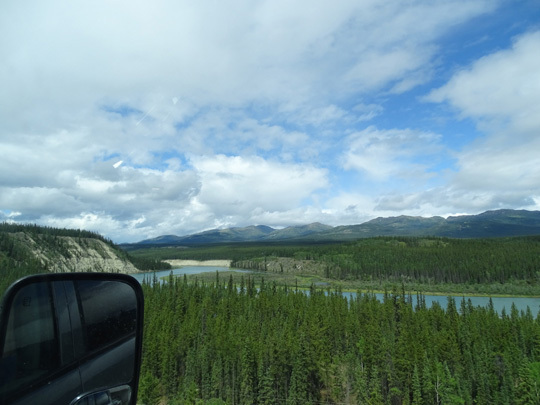 Along the way we crossed the Cassiar Mountain Range, drove over nine rivers, two with the longest and third-longest bridge spans on the Alaska Highway, and followed the shores of two long lakes (Teslin and Marsh). Jim even spotted another grizzly bear! Somehow I missed it. We aren't seeing as many critters this time as we did outbound on our 2012 trip to Alaska. It's not for lack of looking. 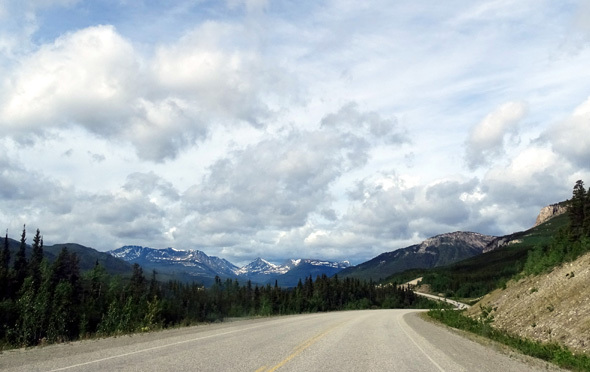 This entry covers our drive from Watson Lake, past the creek that shut the Alaska Highway down for an unprecedented five days in 2012, and on to Whitehorse, where we're spending several nights. I'll also include information about the Pioneer RV Park where we're camping. 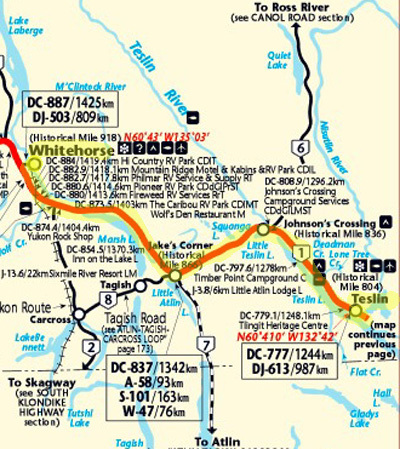 ROUTE: Alaska Hwy. (YT 1). Note all the blue rivers and lakes -- a bunch in this section. It took us less than 5:30 hours with three breaks at rest areas. This segment has numerous rest areas and pull-offs large enough for RVs. TRAFFIC & ROAD CONDITIONS: Traffic was mostly very light the whole way. We saw as many RVs going both directions as passenger vehicles, and very few large trucks. 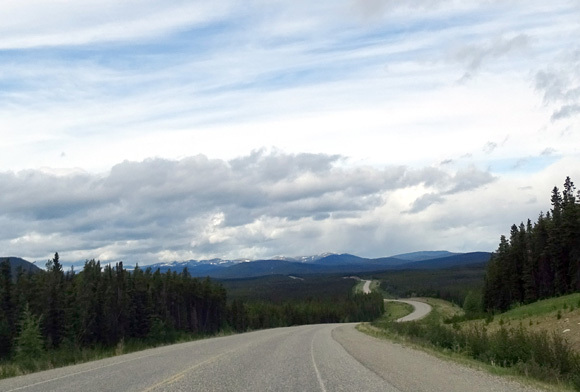 Since we've been on the Alaska Highway we've seen about ten touring bicyclists, most riding solo and some female. One is camped tonight in our campground in Whitehorse. That's a tough road to cycle, with all the long ups and down. I bet they see a lot more than most folks do, though. Wet dirt/gravel -- at least it was smooth. Even though we didn't encounter any more gravel breaks the truck and camper were dirty when we got to Whitehorse. 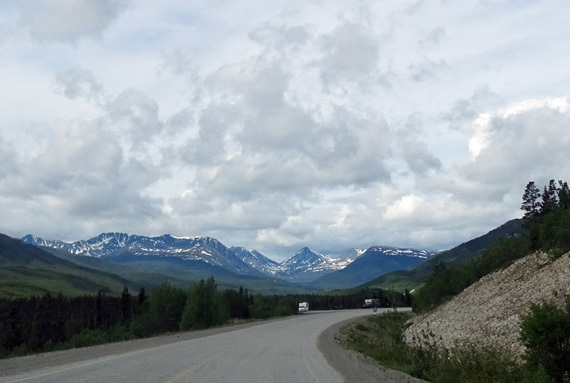 Keeping an RV or other vehicle clean on the Alaska Highway is a losing proposition. Don't obsess about it, wash it when you can, and just enjoy the adventure! RV and vehicle wash at Pioneer RV Park -- and if your pets are dirty, you can wash them, too! We were pleasantly surprised by the mostly-smooth highway today. The repair at Canyon Creek, about 75 miles west of Watson Lake where the road washed out three years ago, looks so normal we almost missed it. 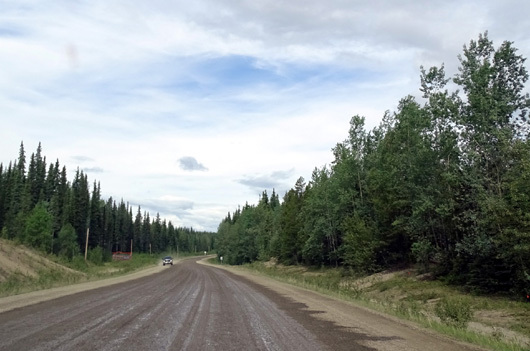 The Alaska Highway is more "groomed" along the side of the road in British Columbia than it is in the Yukon. The shoulders are more narrow here and grasses, small shrubs, and trees are allowed to grow closer to the roadway. We saw lots of lupines, cream-colored Indian paintbrush, and short, bright, fuchsia-colored fireweeds along the road today but I didn't get any good photos of them. TERRAIN: Constantly up and down but no real steep places. Lots of pretty mountains with some snow on top and in the shady ravines. And oh, boy, are there a lot of streams. 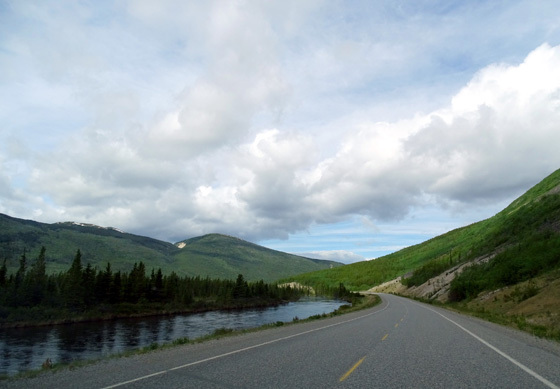 This section of the Alaska Highway closely follows several rivers (Rancheria and Swift, e.g.) 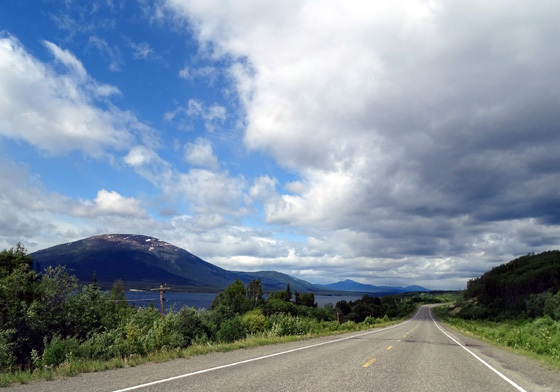 and two long lakes (Teslin and Marsh). Most of the streams and lakes were on the south (Jim's) side so I couldn't take good photos of them going northbound. We crossed at least nine rivers in this section -- Little Rancheria, Rancheria, Swift, Smart, Morley, Nisutlin, Tetlin, McClintock, and Yukon. 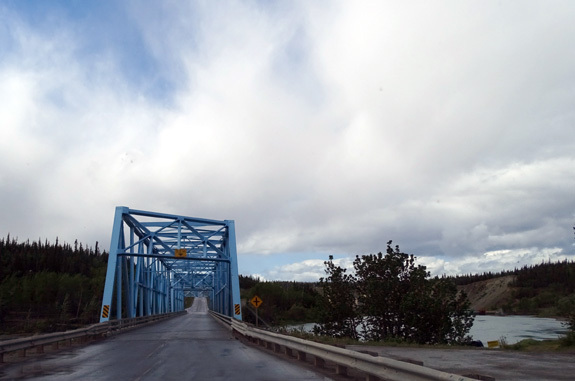 The longest bridge span on the entire Alaska Highway crosses Nisutlin Bay at Teslin. 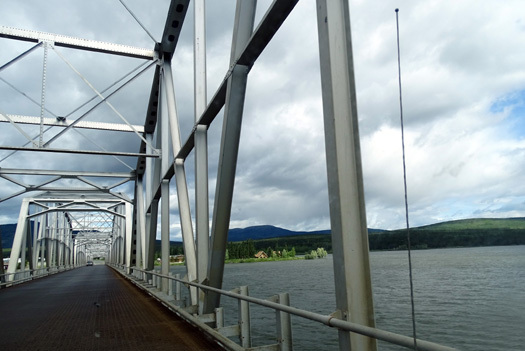 The metal-grated bridge is 1,917 feet long. The Nisutlin River forms the "bay" when it flows into Teslin Lake at this location. Suffice it to say, it's a long bridge over a whole bunch of water. I am not usually afraid of bridges or water but I must admit I had a few nightmares about this particular bridge after our 2012 trip. 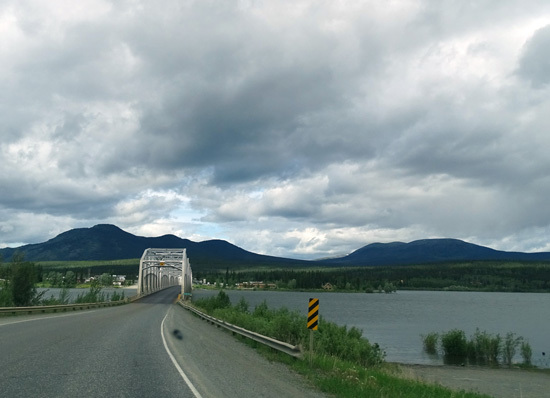 Considering the poor state of most of the roads in the Yukon I have to wonder about the safety of its many bridges. I pretty much forgot about my paranoia until we were about halfway across the bridge this morning, and I wisely kept my mouth shut! No need worrying Jim. 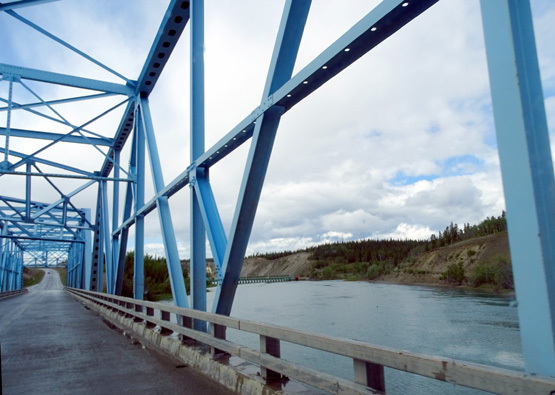 About thirty miles later we crossed the third-longest water span (1,770 feet) on the Alaska Highway over the Teslin River at Johnson's Crossing and I didn't give it a second thought. I don't remember which bridge is second-longest. 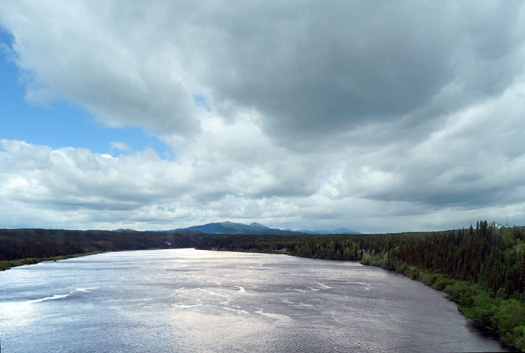 The Yukon River is simply awesome through and near Whitehorse. It's wide and has a beautiful blue color. At approximately 2,000 miles in length, this is one of the longest rivers in North America. 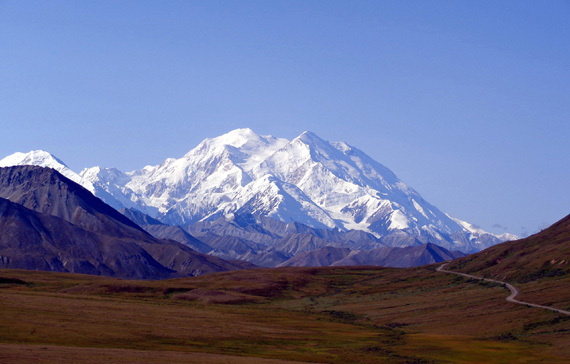 It drains three-quarters of the Yukon and a third of Alaska. It was very important historically in the exploration and settlement of the province. 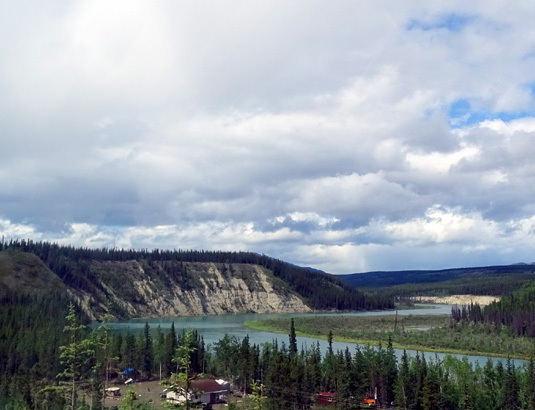 In another entry I'll show more photos of the Yukon River through downtown and scenic Miles Canyon. 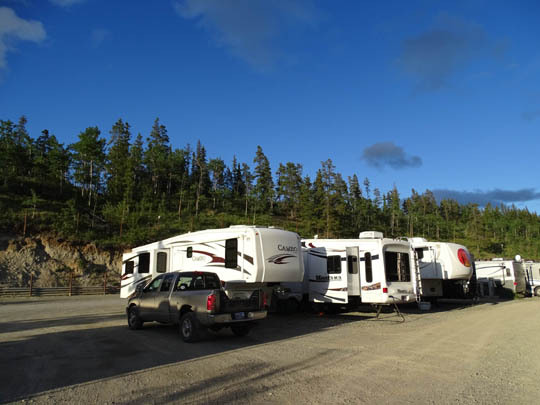 We stayed one night at the Pioneer RV Park east of Whitehorse on our way back south from Alaska in September, 2012 and pretty much had the place to ourselves. It was OK for one night but we thought the Hi Country RV Park looked more attractive from the road and would be nicer to stay in for four nights this time. It has a lot of trees and isn't just a big gravel parking lot. We thought we might get wet in Whitehorse but never did get into any rain. This is the NW end of Marsh Lake, a little before the blue bridge above. We passed Pioneer and drove a couple more miles west to Hi Country. We should have called them this morning to see if they had any spaces large enough for us and we might have had more of a choice of sites on a Friday afternoon. When we pulled in they said only one spot was still available for the weekend. We looked at it but Jim wouldn't have been able to back the Cameo into it because of all the trees along the narrow driveway. We drove back to Pioneer, which still had several long pull-thrus available at 3 PM for however many days we wanted one. We were surprised how many more sites were occupied now than the last time we stayed here. By evening almost all of the big rig sites were full. After the weekend a few more were available. We stayed until Tuesday morning. Cost for full hookups with tax and Good Sam discount is $32.13/CA or about 80% of that in U.S. dollars. We have 30 amps, water, sewer, cable TV, and limited WiFi (300 megabytes a day; could purchase more if we needed it). Our door and most windows face west. Sunrise is about 4:30 AM and sunset is about 11:20 PM. Civil daylight and twilight make it light even longer. I don't have trouble going to sleep when it's still light. My problem up here is getting into bed -- because it's light so late, it's hard to stick close to my preferred 10 PM bedtime. in Whitehorse since we didn't make advanced reservations. 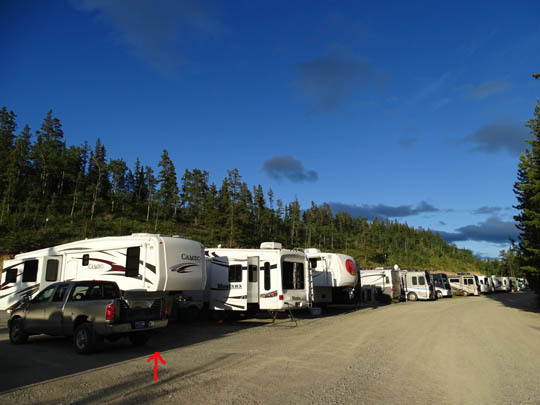 There is an upper level to the campground, up a steep, narrow, gravel roadway. The sites are smaller and don't have cable or WiFi but it's a pretty area for small RVs and tents. 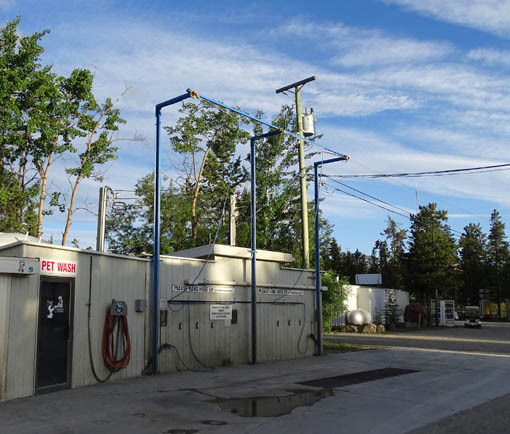 The campground also has bathrooms, showers, laundry room (washers and dryers expensive and not very efficient), dog wash, truck, car, and RV wash, small grocery/gift shop, oil change place, rec room, tent sites, and buses for tours. 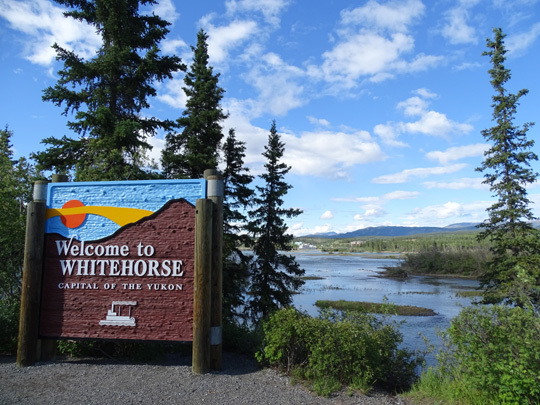 We didn't spend any time exploring Whitehorse on our trip to or from Alaska in 2012. This time we had three full days and this afternoon/evening in the area. The next three entries will describe what we did and saw. 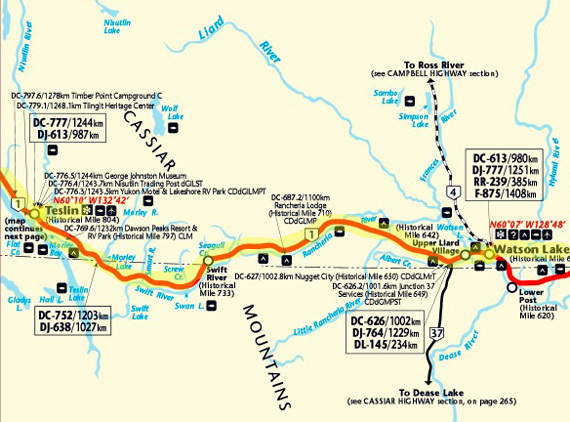 If we don't go back to the Lower 48 on the Cassiar Highway we may stop here again to do even more.